This has been an interesting experiment. The focus of summer & winter is usually on the four classic patterns which can be treadled (1-2-1-2, 1-2-2-1, 2-1-1-2, and 1-1-1-1). For this next set of samples however, I experimented with how each of these looked depending on which tabby treadle I started with. Let me show you what happened. 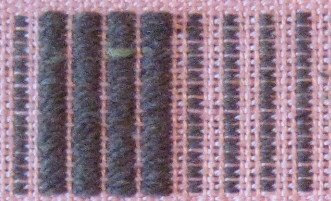 The first sample is the 1-2-1-2 pattern treadling order. It didn't matter which which tabby treadle I started with, there was no noticeable difference in either the pattern or ground cloth. The result looked the same. With the paired treadlings (1-2-2-1 and 2-1-1-2), there was a difference, depending on which tabby I started with. You can see it in the ground cloth. Notice the ground cloth. 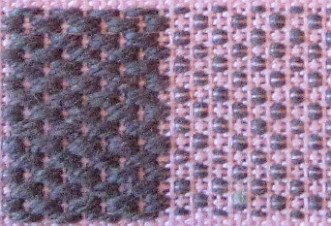 I got a pink (tabby thread) diamond effect by starting with tabby a (top sample). 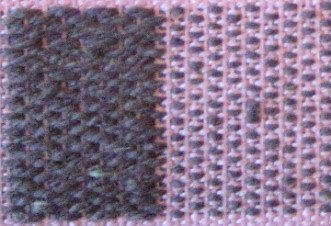 I got a brown (pattern thread) diamond by starting with tabby b (bottom sample). In her Summer & Winter: A Weave for All Seasons, Donna Sullivan explains why this happens. You can see that happening in the close-up photos above. The effect, though subtle, is something I'll keep in mind. However, when I tried the same exercise with the other pattern shed, 2-2-2-2, I discovered that it was the pattern itself which was effected. Notice the columns in the photo above: four fat, nicely defined, straight pattern columns are treadled, along with narrower, less well defined columns in the ground cloth. 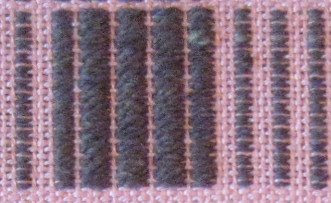 Notice there are five pattern columns, with some variation in width. 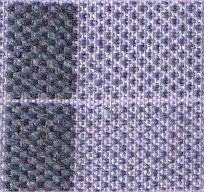 I don't know if you can see in the above photo, but the two outermost columns are formed with 2-thread weft floats, as opposed to the 3-thread floats which form the three center columns (the same as in the 1-1-1-1 sample) . 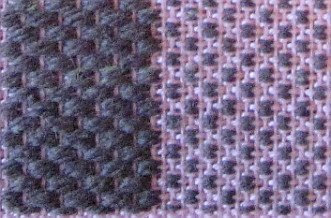 It is the edges of the pattern blocks which are effected. This is why the 1-1-1-1 treadling is usually preferred, and is significant enough to keep in mind while designing. I have to say that this was an informative exercise, which also shows one of the benefits of sampling. I plan to add these samples to my S&W notebook. That's just really cool. One of these centuries we'll have a house where I can have a "loom room." What would you use that pattern for? I mean, would it be upholstery or a jacket? I'm really pragmatic and I guess it's showing here. I always seem to want the know the application. I think it looks terrific, a little like uncut corduroy. Thank you Minikat! Actually, you should see my loom room. I have everything stuffed into a small 3rd bedroom which seems to be in a state of continual disarray. Sometimes I miss my smaller loom! Sharon, between the yarns (8/2s with 5/2 pattern yarn) and sett(16 epi) this particular fabric is fairly stout. It would make lovely upholstery fabric or place mats, though I wouldn't choose those particular colors for that! One of my goals is to experiment with S&W for clothing fabrics. I have a lot of 8/2s in my stash (good for jackets or vests maybe? ), but have been picking up 10/2s, 16/2s, and 20/2s from here and there. Stay tuned! A very interesting look at S&W! I did a similar thing a few years ago when working on the Basic level of the Guild of Canadian Weavers tests. (www.thegcw.org) In addition to keeping the tabby either paired or as singles, it also had to be a balanced weave as well (50/50) The only one not balanced was the dukagang. I found working the tabby in pairs created the neat bird's eye effect which is quite attractive to the eye, but I had trouble keeping my treadling on track. The singles was much easier to track the throws but rather blah (IMHO) to look at. I wove baby blankets using S&W and find that colour is really played up nicely with the block placement. It's also super for upholstry as there are no floats to snag. I'm not a big fan of two or more shuttle weaves so have yet to come back and give it try again...but you sure peak my curiosity!